Why Does My Pool Need a Waterfall? 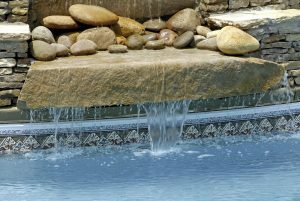 Beautify your pool with a waterfall! Do you have a gorgeous private pool in your yard that you are looking to add even more beauty and elegance to? Adding a waterfall is the perfect solution! Why is adding a waterfall to your private pool a fantastic idea? Moving water is a very relaxing sound, and many people actually play recordings of waterfalls or rain to help them sleep. The waterfall in your pool will be the perfect way to help you lightly doze by the pool on a cool summer night or relax and unwind after a long day at work. Adding white noise to your backyard will greatly increase your enjoyment of your private pool. Filtration is something that every private pool owner struggles with. Luckily, a waterfall can actually add additional filtration to your pool. Waterfalls pull water out of your pool, through a set of filters, and then back into the pool. If you struggle to keep your pool clean enough over the course of the year, adding a waterfall can make your burden lower and the beauty of your pool higher—a winning combination. Algae is an eyesore and a pollutant for your private pool. Having still water sitting in your pool for long amounts of time without any motion will encourage algae growth, even if you do a good job of keeping your pool clean. An easy way to discourage algae growth is adding a waterfall to your pool. They will keep the water in your pool regularly moving and regularly being filtered, so algae won’t have time or space to grow. Get rid of the green fuzz and replace it with a glorious waterfall instead!